One X-ray-related movie scene stands indelibly in my mind: Henri Charrière (Steve McQueen) getting X-rayed in the escape-thriller Papillon. While purchasing his escape from a French penal colony in the 1930s, Charrière dutifully submits to being X-rayed. He lies down, a photographic plate is put under his head, and a big glowing tube is brought near, which then glows even more brightly and loudly crackles for many, long seconds. The scene is repeated with Charrière on his stomach, a new plate next to his chest, and the tube right over his back. When I first saw this film, this X-ray scene brought out loud gasps in the audience. To me, the scene still captures some of the wildness, improvisation, and, viewed through today’s eyes, danger of early X-rays. 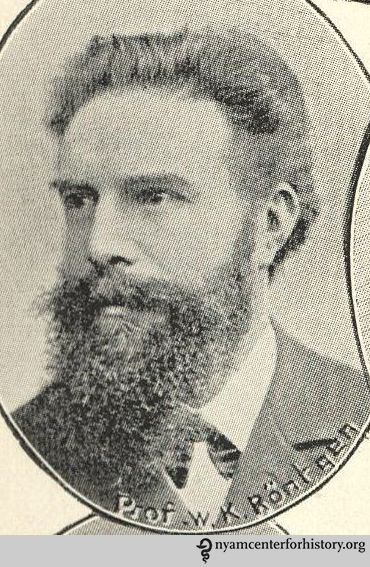 Wilhelm Röntgen. 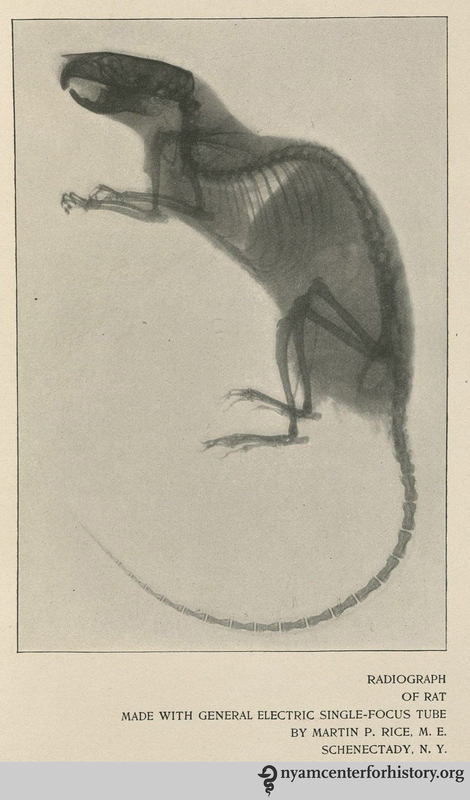 From the frontispiece to Charles E. Phillips, Bibliography of X-ray literature and research, 1896–1897. 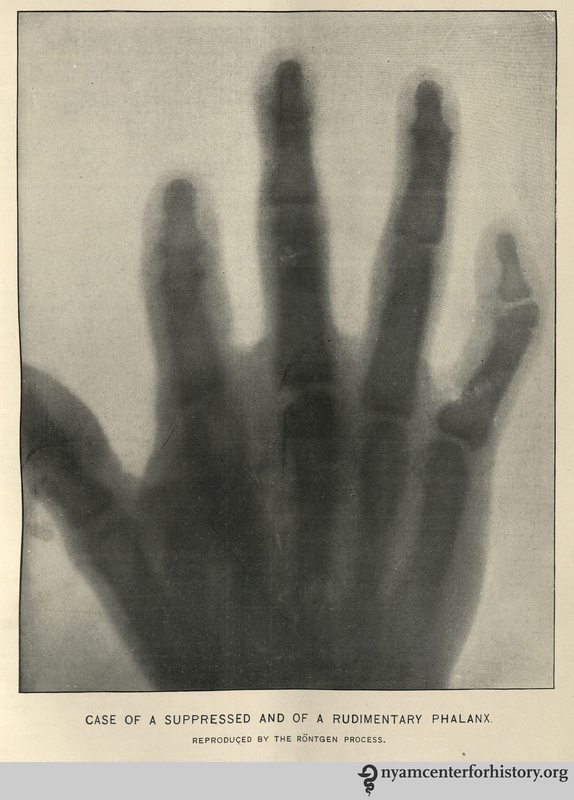 X-ray of the hand of Anna Bertha Röntgen. Image from Bettyann Holtzmann Kevles, Naked to the Bone: Medical Imaging in the Twentieth Century. An 1897 set-up for taking an X-ray of the hand. David Walsh, The Röntgen Rays in Medical Work, opposite page 36. Perhaps the first published X-ray in the United States of a clinical condition. In “Rare Anomalies of the Phalanges Shown by the Röntgen Process,” Boston Medical and Surgical Journal 134(8), February 20, 1896: 198–99. The speed with which this technology developed medically is breathtaking. In 1897, British physician Dr. David Walsh—who already identified himself as honorary secretary of the Röntgen Society of London—published The Röntgen Rays in Medical Work (reprint ed. : New York: William Wood and Company, 1898), almost 150 pages of instructional anatomy, physiology, and legal medicine. 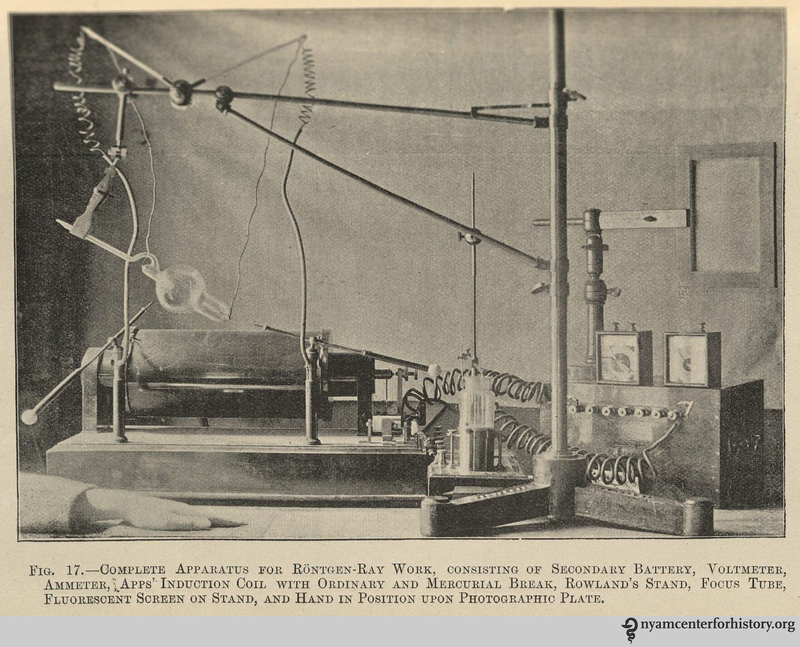 The American Roentgen Ray Society was founded in 1900, and became a forum for working out some of the safety concerns about X-rays. By 1901, Boston physician Francis Henry Williams (who had done that early work with MIT) oriented his practice completely to the topic, as shown by his magisterial 650-page book, The Roentgen Rays in Medicine and Surgery: As an Aid in Diagnosis and as a Therapeutic Agent, Designed for the Use of Practitioners and Students (New York: The Macmillan Company, 1901)—the first of three editions and, in five years, his eighth book on the subject. From the sales pamphlet, Roentgen Ray Apparatus, published in June 1897 by the Edison Decorative and Miniature Lamp Department of the General Electric Company, Harrison, NJ. X-rays are now routine, but scientists continue to develop new modes of imaging. In 2000, the National Institutes of Health founded the National Institute of Biomedical Imaging and Bioengineering. A lot of progress in just over 100 years! 1. Bettyann Holtzmann Kevles, Naked to the Bone: Medical Imaging in the Twentieth Century (New Brunswick, N.J.: Rutgers University Press, 1997), pp. 17–23. 2. Edwin B. Frost, “Experiments on the X-rays,” Science New Series 3 (February 14, 1896): 235–36. See also Peter K. Spiegel, “The First Clinical X-Ray Made in America—100 Years,” AJR 164 (1995): 241–43, from http://www.ajronline.org/doi/pdf/10.2214/ajr.164.1.7998549, accessed November 6, 2014, for photographs of what is believed the first clinical X-ray session, at Dartmouth, and for a copy of that X-ray. 4. 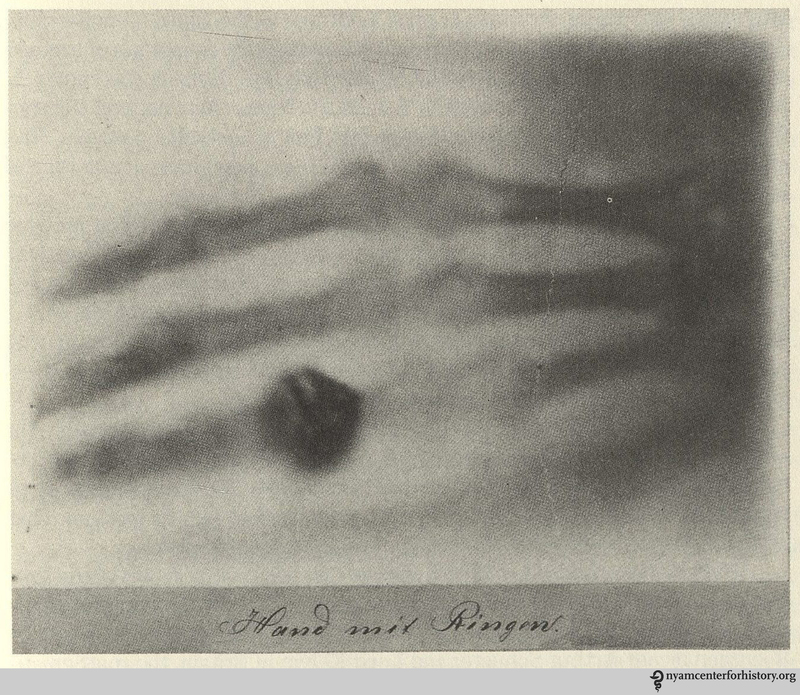 “Rare Anomalies of the Phalanges Shown by the Röntgen Process,” Boston Medical and Surgical Journal 134 (8), February 20, 1896: 198–99. See also Abdul-Kareem Ahmed, “The Race to Give X-ray Vision to Medicine,” posted December 18, 2012, http://scopeweb.mit.edu/articles/the-race-to-give-x-ray-vision-to-medicine/, accessed November 6, 2014. 5. National Academy of Sciences, Biographical memoir of Arthur Williams Wright, 15 (1932):252. This entry was posted in Collections, History of medicine and tagged medical technology, Wilhelm Röntgen, X-rays by nyamhistorymed. Bookmark the permalink. Amazing how quickly that poorly understood technology took hold! I remember the use of X-ray machines in shoe shops; we could tell if shoes fit or not by putting a foot into the slot and pressing a button. The foot bones within the outline of the shoe shone green on the screen! The machines were discontinued by the time I was a teenager.